Is Your Dog Showing Signs? Do you think your senior dog maybe showing signs of Canine Cognitive Dysfunction Syndrome? 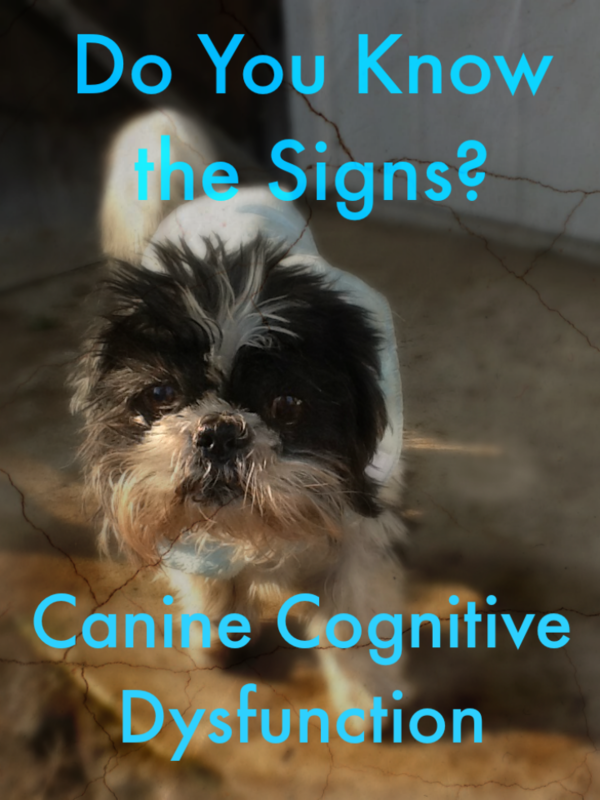 Did you see the signs of Canine Cognitive Dysfunction? Yes, he was cute, the little bounce in his step, the tail held up high over his back, the “smile” on his face, but did you miss the signs? The bounce in his step was actually a rapid nervous pace because he wasn’t in his normal surroundings. The smile was also due to his nervous state and panting was all he could do. But if you leaned in close to pet him as he walked by, he would never acknowledged you or even realize you were there. JoeJo had Canine Cognitive Dysfunction Syndrome (CCDS). But CCDS is not a normal aging process. It is a disease that can lead to a life of lonely isolation in a dogs final years. For JoeJo it started out innocent enough. He always made his daily rounds around the house, then one day he became stuck behind the dining chair and couldn’t figure a way out (backing up). This continued everyday and occasionally getting himself into a corner too. This was also accompanied by screaming. The screaming usually occurred when he was waking up and he didn’t realize where he was at or the fact that I wasn’t around. My husband and I would practically run each other over trying to get down the hallway to get to him and soothe his fear. As soon as he would see us the screaming would stop and his little tail would wag. There were times though the crying would come out of nowhere. JoeJo was a good boy when we got him and learned very quickly that when he had to go potty all he needed to do was walk down the hallway and the door would magically open and out he would go through the dog room and outside. When ready, he would come back into the dog room and bark. then one day while he was barking at the door he happened to be stuck at the hinged side of the door and could not figure out to come in even with the door open and me coaxing him in. He would look at me and continue barking at the hinge. At the time I didn’t know what was happening, he was 13 years old and I initially chalked it up to old age until I chatted with another trainer. As it turned out, JoeJo was diagnosed by his vet with Canine Cognitive Dysfunction and was prescribed Anipryl. Once on the medication, his screaming sessions decreased by 90% and he no longer became stuck under the chairs. Over time JoeJo’s CDS did progress and his mental awareness decreased in various areas. His housetraining pretty much became non existent (thank goodness for laminate flooring & PoochiePads) his sleep cycle changed so much that he would wake up in the middle of the night 2-3x and wander the halls in search of a night light. For some odd reason he was drawn to the nightlights in the bathrooms and then stare aimlessly at them. I was very thankful for the Anipryl as he still became excited when I would come home about 50% of the time. And he still knew who mommy was and would cuddle in my arms at night when we went to bed. For JoeJoe the progression of the disease was pretty quick from initial symptoms to death, approximately 1.5 years. Though I wish his life wasn’t cut short and my heart still breaks everyday, I want everyone to be aware of abnormal signs of aging. I think Canine Cognitive Dysfunction can be very scary for a dog, just as in our human seniors, but there is help to control this disease with proper medication and veterinary care. If you think that your elderly dog has CCDS please download the Senior Dog History Form (courtesy of CCDS in Dogs) and seek your veterinarians advice. It’s never too late to make their finals days happy and comfortable. « Wordless Wednesday: Is It Summer Time Yet? I worry that, as Chester ages, he will get something like this. Thanks for the tips on what to look for. Jessica @YouDidWhatWithYourWeiner recently posted…How Do I Love Thee?